Is this what the upcoming, all-electric 2019 Audi e-tron might look like? We’ve shared a multitude of spy shots of Audi’s forthcoming e-tron electric SUV. The automaker has been teasing this vehicle for almost three years and we still haven’t seen it without the camo. About a month ago, we finally got a look at the e-tron prototype’s cabin. Soon enough, we’ll be on hand to see the vehicle in person at a special event in San Francisco on September 17th. For now, we can get a better idea of what the e-tron may look like based on this latest rendering by Automedia. Audi plans to release full specs and pricing on September 17th as well. Additionally, the automaker will open the e-tron’s online configurator so that potential U.S. customers may reserve their vehicle with a $1,000 fee. However, it’s still unclear when the e-tron will be making its official world debut. Some reports are calling for September in Frankfurt, while others are announcing a debut in Paris in October. It was originally set for August 30th at the Audi Summit in Brussels, Belgium, but CEO Rupert Stadler was arrested, so plans changed. The Audi e-tron will be powered by two electric motors with a combined output of 355 horsepower. Juice will be supplied by a 95-kWh lithium-ion battery pack. According to Audi, the e-tron will be capable of achieving a zero-to-62-mph sprint in under six seconds and have a top speed of ~124 mph. The e-tron will travel about 250 miles on the WLTP cycle. Additionally, Audi says the e-tron’s regenerative braking will boost the SUV’s range by up to 30 percent. Originally, Audi planned for deliveries to begin near the end of 2018. At this point, it’s looking like early 2019 is more realistic. As most of this information is continually changing, we’ll keep you updated as new announcements proceed. 55 Comments on "Rendering Shows What Production Audi E-Tron May Look Like"
Wow that looks remarkably “normal”! With a long hood like that I hope it has a frunk…. Its snout is too long for an EV SUV and its aero doesn’t look real great either and will probably unnecessarily drag down its range. 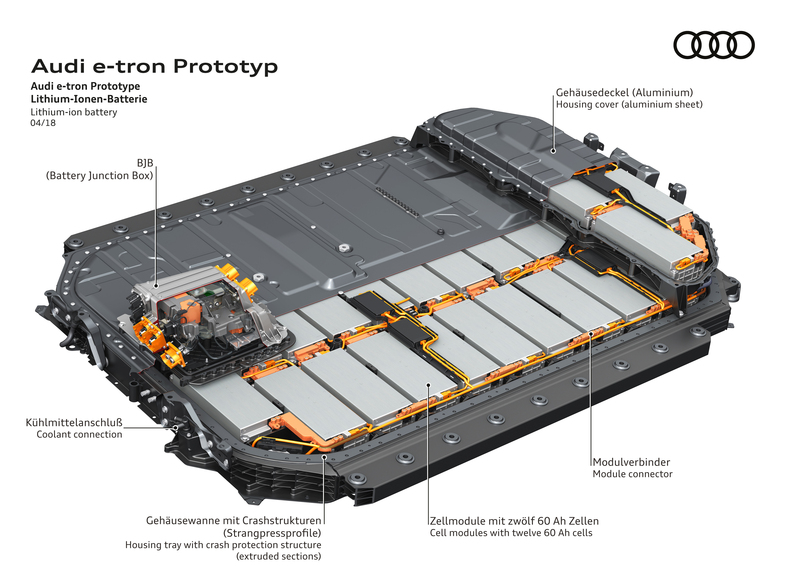 Making EVs on platforms built to accommodate ICE and EV drivetrains leads to these kinds of compromises that a clean sheet design avoids. The car is built on its own EV platform. It was purpose built to be an EV, which is why the development took so long. On elbilforum (a Norwegian EV forum) there is a full thread about the usable capacity of the battery being possibly only 86 kWh. That would give it a nice buffer for durability of the battery and fast charging. total capacity : 432×3.67×60 = 95.1kWh. 248 miles in WLTP cycle. The I-Pace is 298 miles in WLTP cycle for comparison. Style is not just about aero. There’s a reason many people really dislike Teslas car designs. There’s always a compromise between style and aero, companies like Tesla can perhaps be less interested in “style” than the more established manufacturers who will be trying to convert existing customers. 20,000 units for Jaguar is not a small amount, given that they only sell a few hundred thousand cars per year. Some efficiencies must be lost by Audi engineers. The earliest configuration RWD Model S has a positively cavernous front trunk. When AWD was introduced, it shrunk again, and when the HEPA filter was added, yet again. Still, long hood, plenty of room. Even sibling Model X has a usable front trunk. We can’t see all the equipments on the image posted on previous post, some parts are hided. Lexus called and wants it’s grill back. Audi had the big grill first, Lexus copied Audi. Are you saying Audi and Lexus are in a grill size war? Sounds like grill-a warfare going on. And both Audi and Lexus look like stupid relics of the past. Audi, handsome. Lexus weird grills (related to Toyota’s past in textiles). Neither relics. Your mom called. You’re late for supper. Google a picture of a GX460 and then look back at this rendering. Headline is misleading. It’s not an SUV. They need a new category – Fat Hatchback. Oh, sorry. I meant “Crossover”. LOL. Like the Model X really is a BEV minivan. The vehicle classification is based on it’s various measurements (set forth by governments) , not if it can seat 7 or 8. For example a Nissan Rogue (Qashqai) is listed as compact and yet it can seat 7. It reminds me a bit of a rounder Toyota Previa, just lacks the sliding doors. Typically Audi. Nothing unusual here. Meh specs high price…. It’s not Tesla, and it’s not Jag, so anything else, besides the Taycan in the premium/luxury segment, is a welcome EV competitor. Nice rendering, it’s about time someone colored over the vinyl wrap, and exposed the design. It’s good looking, though a bit chunky, and overall it’s generally where Audi SUV styling is headed. I still like the I-Pace more, the design is unmistakably Jaguar, yet the overall design hints that it’s different from their ICE models. It doesn’t have to stand out and scream “I’m electric!” like the BMW i3, but parked in a row of Audi’s latest SUVs it wouldn’t stand out as the electric Audi. They showed the Audi with no camo in Norway yesterday and today for å brief moment, while they showed the prototype of the electric Skoda, that looked surpricingly cool in real life. Audi in Norway has made no changes to the release of the car, which according to them will be late in 2018. There may be a few showcars that will be delivered a bit sooner. Btw.. The grill in the picture and the one I saw did not look identical. Similar, yes – but not identical. Looked good inside. I’ve never really liked cars with huge grills, but it was ok. Still room for improvements. The rest was really nice. I’ll see if I can take a few pictures tomorrow of the Skoda, and the Audi (if it’s still there). They also har the electric plane on display. Looks like an ICE car with boy-racer wheels, but that doesn’t matter. As long as it is better than the GolfEV then it is a step forward. I would hope such wheels are optional and that the standard wheels will be designed for maximum range/efficiency. It’s almost a shame to get rid of the camo. It’s grown on me a lot and looks nice. It certainly stands out. I’d buy one with that option (if I was in the market for an Audi SUV/crossover).